Remove stems from kale leaves and roughly chop kale into bite size pieces. Add chopped kale to a colander and rinse gently under cold water to clean any excess dirt off the leaves. Shake off any excess water; you can leave the kale a little wet as this will help to cook it in the pan. Allow the kale to cook for 2-3 minutes until it begins to wilt and becomes bright green in colour, gently tossing the kale every minute to ensure all leaves are coated in oil and wilted. 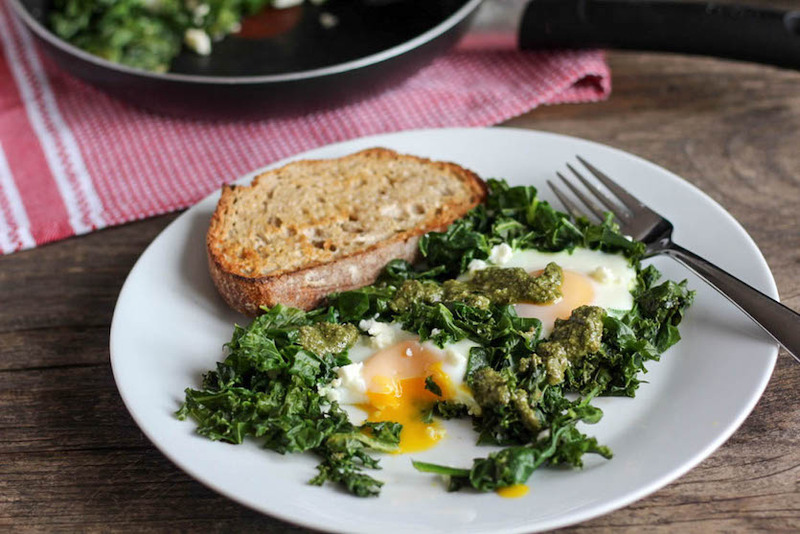 Using a spoon or spatula, make a pocket for each egg in the kale, and crack one egg into each pocket. Cover the pan and allow the eggs to cook until opaque; about 4-5 minutes. Once eggs are cooked, remove from the heat and top with crumbled goat cheese and pesto to taste. Serve with a slice of sourdough toast.